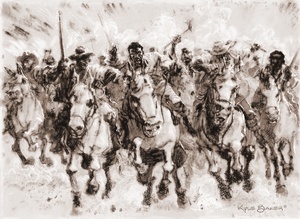 Read an excerpt from Kyle Baker’s graphic narrative biography of Nat Turner here. As The Illustrated PEN publishes a selection from the reissue of my book on Nat Turner, I want to offer some thoughts on the context for its creation. In my work as a graphic novelist (for the uninitiated, a high-flown way of saying comic book maker), I often draft my friends and family into service as an involuntary focus group. I bounce ideas for projects off them, and use their reactions to gauge their commercial viability. I discovered an intriguing phenomenon when first floating my idea for a biography of Nat Turner a decade ago; all of my Black friends and relatives would enthusiastically proclaim it a fantastic idea they could not wait to see in print, while all of my White friends and family would ask who Nat Turner was. While one expects to see such stratified responses in the cases of more “obscure” Black entertainers or even writers (Iceberg Slim or Moms Mabley, for example), Nat Turner is universally acknowledged in academia as one of the major shapers of American and even world history. It is not uncommon for pivotal historical figures to be removed from the public record, but such censure is usually presumed restricted to the province of tyrannical despots and military dictatorships. Mao, Castro, Hitler, and Hussein all publicly destroyed books, art, religious structures and any other method of disseminating unwelcome history. It is believed rare, however, for a self-professed free republic to exercise such censorship. That’s why, in 2004, I was surprised by how little recorded information was available about a man credited as inspiration by such notables as Frederick Douglass, Harriet Tubman, and Malcolm X, to name a few. While the aforementioned trio have been the subject of countless written volumes, and numerous dramatizations on film, stage, and television, only William Styron’s fictional biography of Turner has had any popular impact of note. Now, there is a major motion picture, fraught with controversy on its release. I received a top-notch education in one of the finest, most exclusive institutes in America, including rigorous schooling in American history, yet the sum total of knowledge of Nat Turner imparted there amounted to one sentence in a history textbook, the gist of which was that Turner led a failed slave revolt, a turning point in American history launching a chain of events which culminated in the Civil War. It wasn’t until I encountered a two-page retelling of Turner’s life in The Autobiography of Malcolm X by Alex Haley that I discovered enough to persuade me it would be good subject matter for a book of my own. While I was convinced I had found a vein of untapped literary gold, I was unprepared for the hurdles I encountered in bringing this tale to the masses. In a thirty-year career, I have been published by Warner Books, Random House, Harper Collins, and Scholastic, among others, yet I first chose to self-publish Nat Turner as individual comic books before working with Abrams on the collected graphic novel, so clearly I had an inkling of what I was up against. Two prominent Hollywood producers of color I worked with told me point-blank that while they loved my book, and thought it may even be my best work to date, it would never ever be turned into a movie. One of those producers went on to produce Django Unchained. Think about that. On a promotional tour, I was interviewed by San Diego’s largest Hip-Hop radio station, and we ran a book giveaway contest to listeners who called in. While the radio station gleefully offered my other cartoon books, they declined to promote Nat Turner, telling me they felt it was too “pro-Black.” In other words, my book was too controversial for the Hip-Hop station and the producer of Django. If it seems I’m repeating myself, it is only because I still cannot comprehend it. It may have been naiveté or willful denial on my part, but I had assumed contemporary America might embrace a biographical dramatization of the man who helped end slavery. Turner himself was inspired by reading of Moses, a prophet justly celebrated for battling slavery in his day. Outspoken abolitionists such as Douglass and Tubman have statues, schools, libraries, and even streets named for them, as they should. Abraham Lincoln and Martin Luther King Jr. have holidays in their honor, largely because of their efforts toward racial equality for all people. Yet there are no statues, parks, or holidays to honor the memory of the man whose death inspired the movement, which continues to this day, as humanity strives toward the venerable goal of ending racism forever. There are countless monuments to the Confederate insurrectionists who failed to overthrow the United States. By definition, those who attempt a violent coup are treasonous, yet new monuments to these traitors are proposed even to this day, and the flag of an acknowledged and defeated enemy of our republic and its freedoms is flown proudly over the capitols of government buildings in Southern states. Millions of taxpayer dollars have been allotted to immortalizing the glory of those who fought to preserve slavery, yet few are willing to speak out for a man who died to end slavery. When I bring this point up, detractors counter with the fact that Turner’s revolt killed women and children. I understand and acknowledge that the slaughter of innocent civilians is a tragedy, and I believe that nobody deserves to be murdered. That said, Turner was inspired by his reading of Exodus. The plagues of Moses slaughtered the firstborn children by thousands, and we rightly laud that Prophet as a great man who freed slaves. Sherman’s March was a bloodbath, yet we all agree he deserves a monument, along with Grant and Lee. Even General George Washington, who led a bloody rebellion on our soil, is justly honored as a great man. Many heroes with substantially larger body counts are enshrined and glorified by we who owe an unpayable debt of liberty. Which brings us to this question: Why not Nat Turner? Kyle Baker has authored more than 15 graphic novels and illustrated hundreds more in a career that extends over three decades. He is the winner of eight Eisner Awards and four Harvey Awards, among others. A pioneer in the graphic novel format since the 1980s, Baker helped define and evolve the medium with works such as Nat Turner, Why I Hate Saturn, and King David. Other titles include The Cowboy Wally Show; Truth: Red, White & Black; and Birth of a Nation. Baker has lectured at Dartmouth, Howard University, the Library of Congress, and the School of Visual Arts, and he regularly teaches homeless teens for the City of New York.